Appropriating his mom’s nickname, Joffe branded himself Farmer D and launched a farm consulting business as well as a line of biodynamic compost. Eventually, he opened a gardening supply shop in Atlanta, where he still sells compost, gardening tools, seeds, plants, and raised beds. In his new memoir/farming guidebook, Citizen Farmers: the Biodynamic Way to Grow Healthy Food, Build Thriving Communities, and Give Back to the Earth, he tells his story and shares his passion for social justice. We talked to Joffe recently about beginning farm finances, biodynamics, and how to get more fresh produce into under-resourced areas. How do you define a “citizen farmer”? Essentially anyone who is committed in some way to improving our food system and the health of our planet through action. 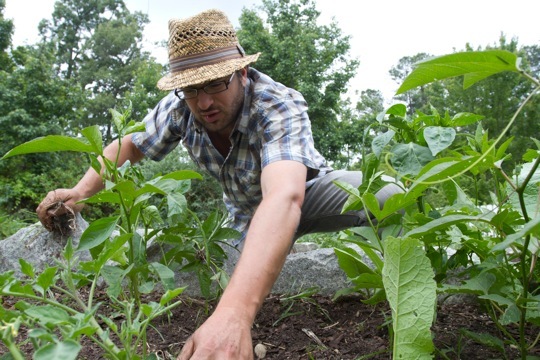 You can be a citizen farmer from a classroom, a kitchen, a board room, or the mayor’s office. You left your own farm in Wisconsin because you wanted to raise awareness about biodynamic agriculture among the masses. How did you go from being a farmer to a farmer-activist? After working at a few nonprofits, you found yourself becoming what you call an “entre-manure.” How did that transformation come about? I had had this idea for years, of bringing the farm into the Jewish summer camp environment. It would be a way to get better food into the cafeteria, get kids connected to the environment and farming. I presented this idea to a Jewish Community Center, near where I was going to school in Georgia, and I managed to raise the money and build this garden that’s still there. It was a huge success. I didn’t even realize it, but for those few years, I had been building my consulting expertise. When I got the opportunity to work at Serenbe, just southwest of Atlanta, I’d been doing it already. Was Serenbe the first of these so-called “agrihoods”—planned communities built around a farm? It was one of the first. There was Prairie Crossing, and a few really small things had happened—co-housing communities with small farms. But Serenbe was the first that had clustered, hamlet-style villages around a farm. It was also the first on this scale. Though you’ve worked as a consultant on private developments around the country, you’ve kept doing pro bono work, building farms and gardens for homeless shelters, youth prisons, and boys & girls clubs. Is that part of your company’s mission? My bread and butter clients are big developments and high-end resorts and I take on as much of the discounted nonprofit stuff that I can afford. I’m in a position now, in my new role [as ranch development director] at the Leichtag Foundation, where that’s more my core. You say in your book that “most biodynamic farming lessons are no more mystical than The Farmers’ Almanac.” Is there a misconception about biodynamic farming? So it’s important to shine a light on this; it has been a big part of my experience with agriculture. It brings a spiritual approach that I relate to; organics doesn’t necessarily have that component. From the science perspective, sure, organic agriculture is more developed and scientifically proven. But I’ve seen biodynamics in practice and I’ve seen it work. The book is not all about biodynamics, but my goal was to demystify it a bit, and show that it can be effective. The latest Agriculture Census data shows that over half of America’s farmers don’t call farming their primary occupation—presumably because they can’t make enough money. What financial advice would you give young farmers? Most farmers already know this: It’s a labor-of-love career. The quality of life is the richness that you get. My advice is to [prioritize] good planning, good management, delegate, and engage your customers so that they can participate as much as possible. Building a good team is key. And having somebody in the family that has a stable job is always a good thing! Farming is fickle, and you never know. So, have another creative revenue stream that’s not as dependent on the crop harvest–whether that’s something you do collectively as a family or via events, cooking, consulting, or whatever. Find opportunities that can relieve some of the financial burden or provide you with stability. If you can work within an existing infrastructure—whether that’s an incubator or an existing agricultural or land trust operation where you could share equipment. The last thing I would say is do a CSA. It provides you with low-risk seed capital. Are there other entre-manurial ways of making a living as a farmer? There are more and more farm management and educator roles out there. Universities are starting farms, and so are developers, nonprofits—even cities. And there are some ways to save money with government programs—subsidizing organic certification, or putting land into conservation easement to reduce taxes. Where can farmers learn more about these programs? ATTRA (National Sustainable Agricultural Information Service) is a government resources site for alternative farming. And SARE (Sustainable Agriculture Research and Education) program, lists grants. The USDA is also a good resource, too. There’s a whole beginning farmer section that helps identify resources; it’s amazing! You went to 13 banks before you found one that would secure you a loan. Any tips? Ha! Part of it was having a good business plan. I said: Here’s how a CSA works, and here’s my financial plan, and here’s my experience. And part of it was my dad guaranteeing the loan! Today there are beginning farmer loans through the FSA (Farm Service Agency at the USDA), but there weren’t at the time. A lot of the banks just looked at my crop list and their eyes rolled back. “You’re not doing corn and soybeans?” They just did not understand it. There is a lot more support from social venture type funds now. Slow Money, for example. And lot of starter farms are being funded by angels–wealthy people who are passionate about this. Aside from donating extra produce to the local food bank, what can citizen farmers do to get more healthy food into low-income neighborhoods? Encourage vegetable gardening, especially in neighborhoods that lack access and resources. Some CSAs offer programs where you can sponsor a CSA share for a family in need. Advocate to local government, business, and community leaders about how important it is to get fresh food into low-income communities, schools, and shelters and support local sustainable agriculture. I’ve always had a really hard time explaining what I do. So the book has been a good way to express my philosophy, my motivation, and my goals. My driving passion has always been to raise awareness and make change on a big scale; a book seemed like a great way to do that. Photo at the top by Rinne Allen. Thank you, Hannah, for this great article. Every bit of it was of interest to me and you it wrote in an easy to read way. I am not a farmer, but I always thought a farm life would be amazing. My husband did not agree. Now as a retired RN, I am looking for ways to help improve the biodiversity of our food supply. Or at least talk up the need for it every chance I get. I've bookmarked this so I can refer to it. I'll look for more articles of yours often.